Murder on Mokulua Drive is now available as a downloadable e-book from Amazon Kindle. Donload a copy of Murder on Mokulua Drive for only $4.99! 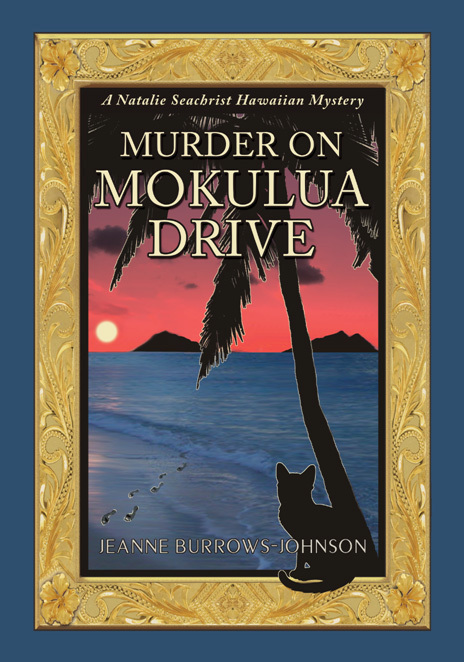 Portland Book Review ~ "Murder on Mokulua Drive is an engaging and enjoyable read for those who love deeply built connections and rich details. A worthwhile read, even for those who may enjoy a slightly faster paced and higher energy murder mystery." Seattle Book Review ~ "A murder mystery in paradise, Murder on Mokulua Drive is full of heart, sweet romance, and a deep sense of family with layered characters, strong female relationships, and the scenic setting of Hawai'i." Kirkus Review ~ "The most striking feature of Burrows-Johnson's (Prospect for Murder, 2016) book is a winsomely detailed setting, from seafood and Kona coffee to Hawaii's generally relaxed ambiance (including a hammock on the lanai). As such, the story's mystery is simply another task for Natalie, along with moving to Lanikai and planning Keoni's surprise birthday party. Nevertheless, the protagonist is first-rate�A diverting tale led by a smashing amateur detective whose dexterity far exceeds her paranormal gift." Manhattan Book Review ~ "Overall, I was impressed by the character development in the book. I felt that I got to know everyone rather well� It's nice to read about characters of all ages, and this book had the young and the old. The story had many layers as well as some twists and turns, which kept me glued to the pages�"
The US Review of Books ~ "This author knows her genre, and she skillfully blends familiar ingredients that faithful cozy mystery readers will appreciate. The story is further enhanced with several compelling flourishes. First, the author draws on the rich history of Denmark's safe evacuation of its Jewish population during World War II and integrates this legacy into her 21st-century characters. Next, while cozy sleuths are often known for their intuition, Natalie's dreams are downright prescient, bringing a mystical quality to the crime-solving activities. Finally, the book's love affair with its Hawaiian setting is contagious, and the location details create an alluring atmosphere. All these added components bring depth and freshness to a familiar format."